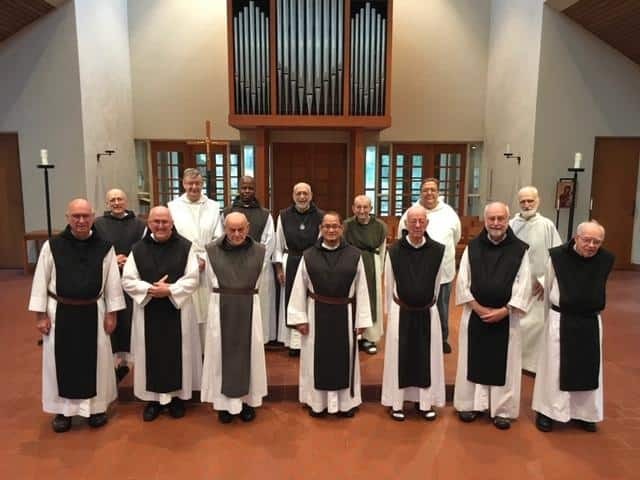 We, the monks of Mepkin Abbey, are responding to God’s call to live in solitude and silence in and for the Church according to an ancient form of radical Christian discipleship focused on seeking and finding God in community where we “are of one heart and soul and everything is held in common” (Acts 4: 32-33). We live the Rule of Saint Benedict embodied in the Cistercian tradition, praising God in our prayer, our meditative reading of Scripture, our work, and our hospitality, obeying the call of the Holy Spirit to ceaseless prayer and sharing the sufferings of the present time until the Lord returns (Rm 8:18-23). As we the Brothers of Mepkin Abbey move forward from the present reality of our community, we envision ourselves co-responsible for our future. Through shared leadership, we call each other to accountability with ongoing dialogue regarding monastic, community and administrative matters. Individual meditative reading of the Scripture in the morning and evening hours and at intervals, as we continue unceasing prayer. We live by the work of our hands on the land made sacred by our search for God in participation with God’s creation and restoration, in providing a livelihood for ourselves and the poor, and an offering of lives of fruitful sacrifice and penance, in unity with our brothers in a common purpose. We communicate the wisdom of our monastic traditions to those who use the Clare Boothe Luce Library as a learning resource, and those who attend the lectures, conferences, and cultural programs presented by our community. We make available the natural beauty of Mepkin by developing and maintaining the public Gardens of the monastery to our visitors. We pass on the richness of our traditions through the choice of books, religious art, monastic products and handcrafted items we offer in our Abbey store at the Reception Center.